This Behaviour Bytes is about the good and bad of Puppy Classes - so if you have a puppy, or looking for puppy classes, then read on... if not, then thanks for reading so far! Tegan with Piper at Puppy Preschool locally. Our newest family member, Piper, who joined our family in February 2014 made me revisit all of the fun puppy stuff which I knew as a vet, but forgot about as an owner. Aside from the vaccinations, sleeping arrangements, flea, worming, washing, food, vet checks, pet insurance, etc etc etc things that need to be sorted, teaching Piper to be a great family member was equal top of the list of things I needed to do or learn about. Veterinarians don't automatically have great children (although I am blessed to have them), and nor do they have well behaved, sociable, happy dogs or cats. It comes through effort and giving them experiences from which they learn positive outcomes. 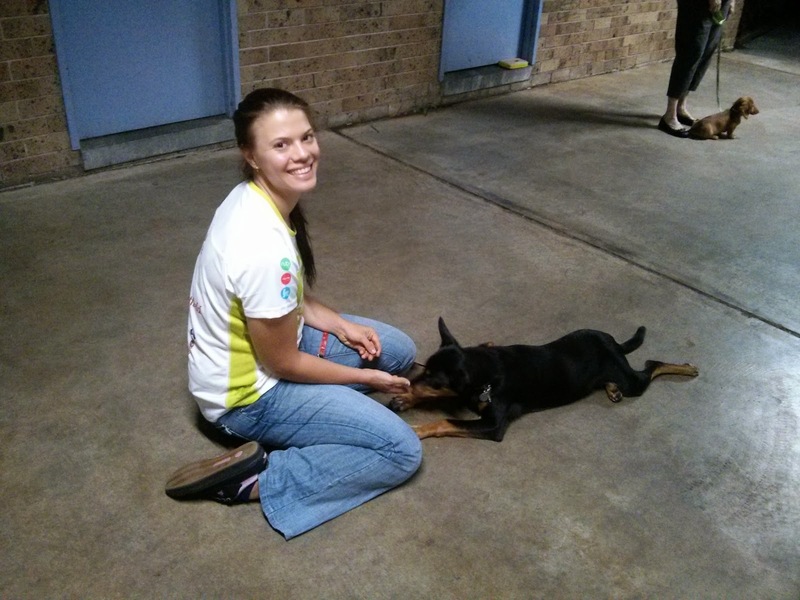 Joining a Puppy Class is one of the most important things you can do for your puppy. But it can equally be THE worst thing you can do as well. What your puppy will learn and experience from the 8 to 15 week age in your chosen puppy class, they will take with them when they interact with other dogs or people in the future. Part of our behaviour comes from our experiences and learning, and this is where Puppy Preschools can be a good thing, or not so good thing. to get there each week. I will share with you some tips to help you choose the right class for your puppy. There is no "perfect class" out there, and each class there is always a different dynamic in terms of personalities. As a pet owner, how do you know if a class is good or not? Our most recent experiences with our puppy, Piper, visiting the puppy preschools in our area, and in Sydney, was an experience. The differences between them was astonishing. Best Practice dictates that there should be around 6 puppies per two instructors, and the ages should be around 8 weeks to 14 weeks. Ideally, puppies are grouped together according to age, not size. The instructors should sight your vaccination certificate and it is best if your puppy has had at least one vaccination before joining. Even though all of the puppy classes literature states that all puppies learn better when wearing an Adaptil collar, or in an Adaptil infused room. Piper was the only one in her classes wearing one. Play time between puppies should be "controlled" in the sense that it should not be a "free for all". With Piper, we did attend a class where it was a "free for all", with bullies and fearful behaviours. Meeting other puppies whilst on the leash is not recommended either, as when your puppy or adult dog is on a leash, it should be watching you, not figuring out who else it can meet. Letting puppies interact whilst attached to a leash has been linked to interdog aggression or leash walk aggression as they get older. What happens is that the puppy believes that every time it sees another dog, it has the right to go play with it. It will then get frustrated when it can't. The issue of "play" in classes is controversial, but I do believe puppies need "play time" and time to "socialise" with other dogs and people, as this is what puppy classes are all about. 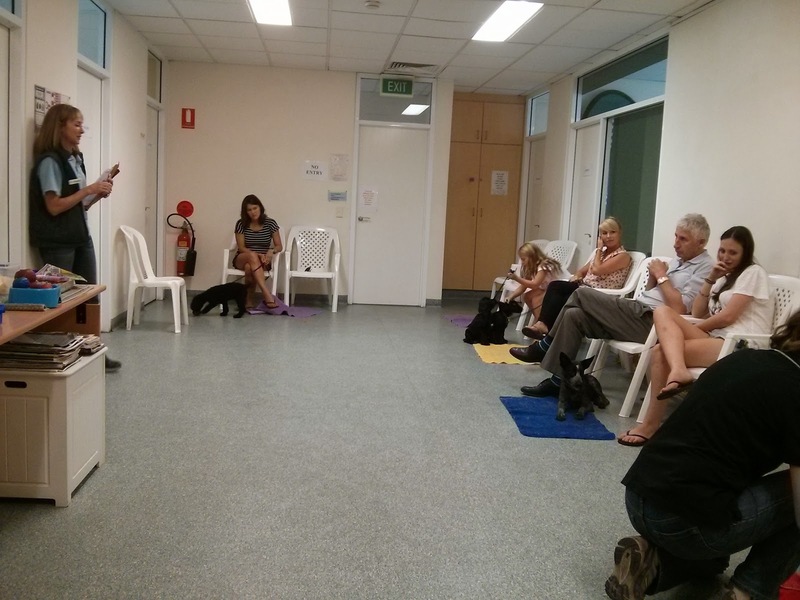 Puppy Classes should be informative without pushing brands or services. They are an ideal opportunity for you to ask any question you may have, and to share the knowledge or any tips that have worked for you. had a plethora of "entertainment"
A well run class will have a range of dog toys and treats to keep your pet amused whilst the other pups are doing their training and fun. They should hand you some food to have in your own hand so you can reward them too, and keep them distracted. A great class will allow each puppy to have some training time with the instructor as well as with the owner. You should also have an opportunity to practice it too. Your instructor should demonstrate the technique, and go through variations of that technique that your puppy may need (there are many ways of getting a pup to sit and drop). 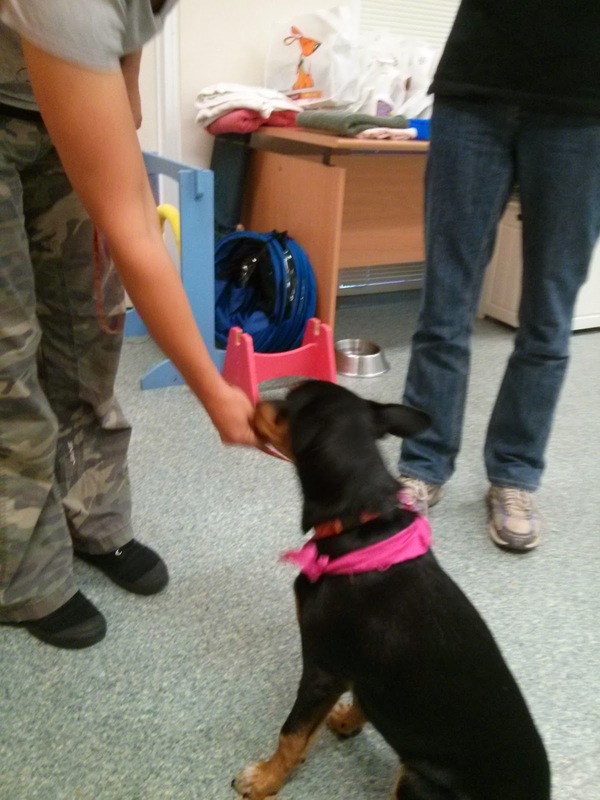 Training should always be "positive reinforcement", which is different to "bribing them with food" or "lure training". Positive reinforcement is simply rewarding the behaviours you do want, which in turn, means those behaviours get repeated. It is my belief that Puppy classes are very important for socialisation, and also, for identification of potential behavioural problems. 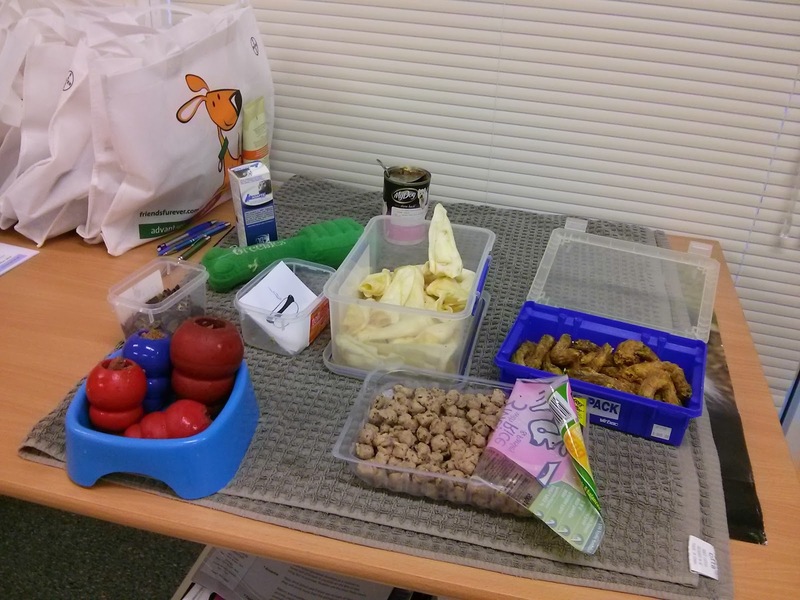 It is only through attending a class, that we realised that our Piper was "protective" over her treats. This is called "resource guarding". This is something that we can't stop her from doing, but it is something that we can now be aware off, and minimise her repeating that behaviour. I remember many years ago, I had a puppy who we identified with a thunderstorm fear (we played the CD of a thunderstorm and it was very scared). Through early re-training and desensitisation, this puppy went on to have no fear of any loud noises. Your puppies first few weeks in your family are crucial. Selecting the right class is so important, so do your homework. If you need any advice or help, please call us on 42 845 988, or even email me. Disclaimer: Puppy Preschool was a concept that I first heard about in 1991 at the Australian Veterinary Association Conference in Adelaide, by guest speaker Dr Kersti Seksel, the top Aussie guru on Puppy Preschool programs. I was sceptical walking into the lecture, and was enthusiastic to get it up and running after the lecture. At that time, I was working at a respected veterinary hospital in my area. I was able to convince my employer that it was a worthwhile exercise, although it had never been done before locally. It took me two months to learn, organise the handouts and the information needed, and to attend puppy classes at Seaforth Veterinary Hospital, as it was all about "best practice" for me (then as it is now). There were no videos, booklets, classes or Delta in those days It was ground level, and I learnt the old fashioned way - by doing! I ran Puppy Preschool, virtually weekly, from 1991 to 2003, and stopped due to family commitments, but I never stopped learning about what is best practice in running classes. Visiting classes this year with Piper has reignited my love for Puppy Classes. We can't wait until we are able to start our own again. 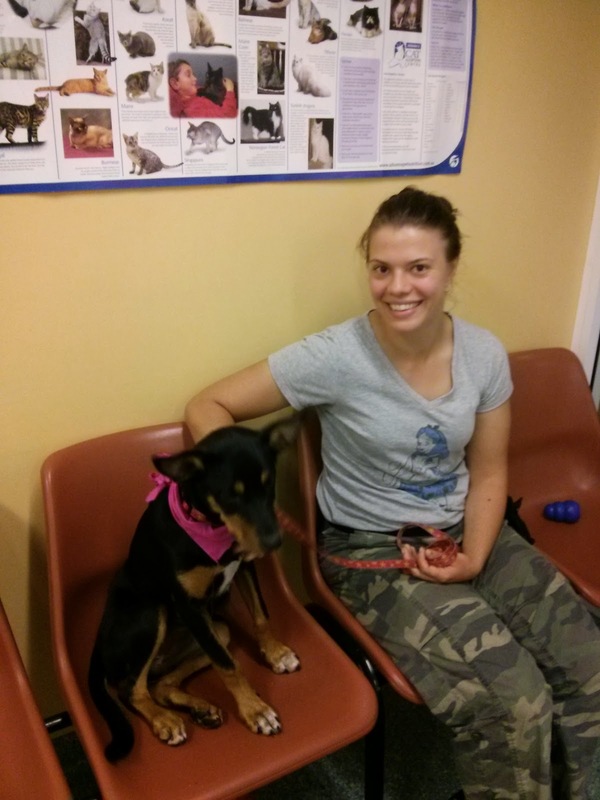 This is Piper, with Tegan at Seaforth Veterinary Hospital. We dressed her up for her "final class"